Our Digi-cards download cards are printed on high quality gloss PVC plastic and are standard CR80 size 3.37 x 2.125 inches in size and 30 MIL 0.03 inches thick. Our Digi-cards download cards are the best known download cards in the world with thousands of clients and mayor labels, artists and publishing companies. 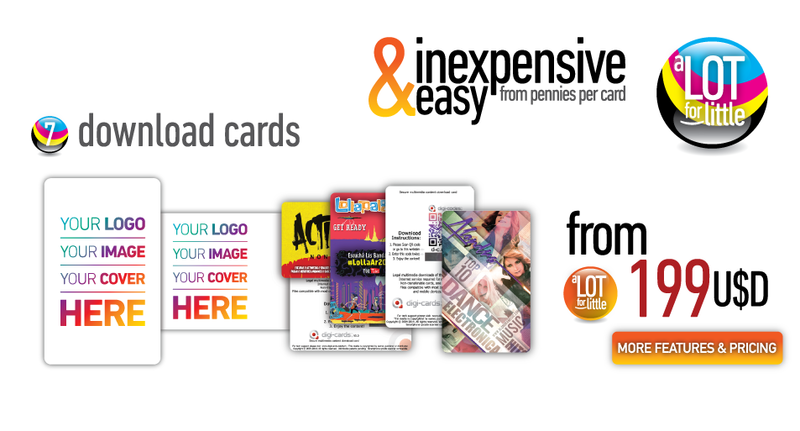 We offer complete packages so that you might distribute any multimedia content or other promotional materials, for more information you can visit www.download-cards.com.com or www.digi-cards.com.